What Was Wrong With the Old Version? For this year's Rick's Texan Reviews Annual Christmas Special, I'm going for two Christmas-themed movies: one on Christmas Eve, one on Christmas Day. The Christmas Eve review is a Ghost from Christmas Films Past, the Christmas Day review is from a Ghost of Christmas Films Present. 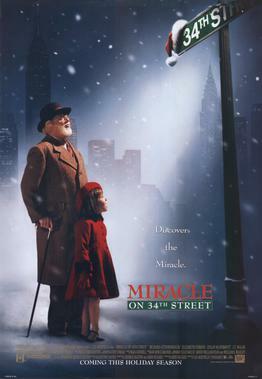 In keeping with Rick's Texan Reviews Annual Christmas Special, for this year's Christmas film review, I've chosen a film I've long avoided: the remake of Miracle on 34th Street. A large part of my avoidance came from the fact that as far as I was concerned, there was simply no need to remake a film that is practically perfect as is. What more could be told? What improvements could be made with regards to the 1947 film? The late and much-missed Maureen O'Hara, who starred in the original Miracle on 34th Street, commented with pride that the film had been remade three times (two television adaptations and this film). "Each one...flopped", she said with joy in her voice and a gleam in her Irish eyes, taking great delight in the fact that her version is the one most remembered and watched, the others pretty much forgotten. Well, given it is Christmas, I opted to finally tackle what I had long not wanted to deal with. I found that Maureen O'Hara's perceptions about at least this version were accurate: it IS a flop. She had every right to stomp over every effort to improve on her film. 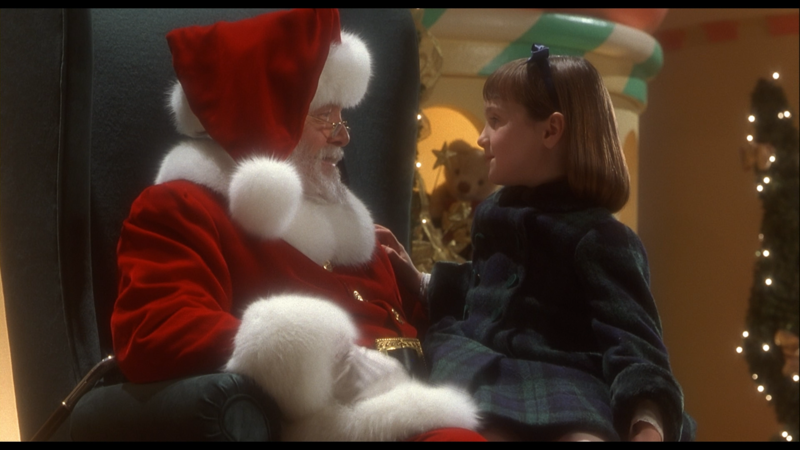 The 1994 Miracle on 34th Street, while not as dreadful as I'd feared, simply has no reason to exist. 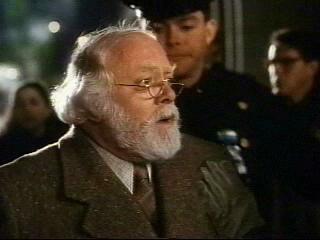 An old man (Richard Attenborough, affectionately known as "Sir Dickie") wanders into the Cole's Thanksgiving Day Parade (Macy's I imagine wisely not wanting to be part of this, but I wonder: was Kohl's around at the time?). We should note that this old man was mistaken for Santa Claus by a little boy, only to have the old man whisper to him, "I Am". As he IS Santa Claus, Cole's director of special programming and events Dory Walker (Elizabeth Perkins) begs him to replace the loutish, boozed-up Santa. He does so, and his success irritates Cole's rival, the Wal-Mart like Shopper's Express, headed by EVIL corporate head Victor Landbergh (Joss Ackland). He wants Cole's in his empire (though we're not sure why) and a last-minute loan to Cole's saves it much to his irritation. This Kriss Kringle is a HUGE success with EVERYONE loving him, so much so that he, to his puzzlement, gets in front of cameras and says, "Good Morning, America". Kriss even sends people to other stores, which shocks everyone and leaves customers, oddly, more disgruntled than pleased. Dory knows there is no such thing as Santa Claus, words of wisdom she's passed on to her daughter, Susan (Mara Wilson). Susan, who is really, REALLY wise beyond her years, is constantly trying to get her mother together with next door neighbor Bryan Bedford (Dylan McDermott). They do go out but Dory just doesn't want a relationship. Susan is beginning to question whether Kriss is THE Santa Claus when jolly old Saint Nick is caught up in a scandal! The disgruntled ex-Santa (who apparently hangs out at a Santa bar...I'm not kidding, a whole group of Santas were drinking in a bar) sets up Kriss by first antagonizing him at the Cole's Christmas display and then following him when he leaves, suggesting that he gets his jollies from touching children. That's right folks: in this family film, the subject of pedophilia is made a main point. So angry does Kriss get that he whacks him with his cane. Conveniently, two minions of Shopper's Express just happen to be there, along with a photographer. The whole thing shocks the country (assuming the country generally cared about one department store Santa who really hadn't done all that much to merit the attention he got, but whatever). The bad press (and worse photo) get him locked up with the potential to be sent away to a nuthouse, but Bryan, who happens to be a lawyer, decides to defend Kriss. Dory for her part is furious that Cole's could so willingly feed Kriss to the lions. Now, Bryan himself doesn't believe Kriss is Santa Claus and despite all the witnesses he can produce, cannot find a way to prove his case. It takes Susan and a one-dollar bill to prove that Kriss Kringle IS THE Santa Claus. In the end, Kriss is freed, Bryan and Dory are essentially hoodwinked into getting married right after Midnight Mass, and Susan gets what she's wanted: a home, a father, and a baby brother (the last one though will take some work and some time). As I watched, two thoughts kept coming to me over and over again. The first was that this Miracle on 34th Street was trying TOO hard to be sweet and cute and, more surprisingly, trying too hard to be smarter than the original (which is was not, not by a long shot). The second was that it was essentially directionless, drifting, drifting, drifting, with no idea what it wanted to be. In regards to the first part, we see this in how the characters are. We know for example that Landbergh is EVIL because when we first see him, ominous music is playing, and he is alone in a gray office. In regards to the second, what Landbergh's beef with Cole's is never appears to play a large part of the story. In fact, for large chunks of it, we forget that Landbergh's machinations are suppose to relate to the goings-on. We see him at the beginning, plotting...something, and at the end, when he's enraged that New York State has declared Kriss THE Santa Claus. Why he ever cared is pretty much left to our own imagination. This I imagine is due to SO MUCH TIME being wasted on the romance between Dory and Bryan, a romance that feels as artificial as the snow inside Cole's displays. Perkins and especially McDermott are pretty to look at, but the characters never felt as if they'd do more than share pleasantries in an elevator, let alone get married. It's as if writer John Hughes (yes, THAT John Hughes) decided Miracle on 34th Street was a romantic drama about neighbors than it was about whether or not Santa Claus is real. Hughes couldn't allow the romance to build up gradually, but instead decided they were to be secretly in love with each other and just went with that. Now, I know I'm going to get grief over this, but I did not like Mara Wilson in this. Oh, she's cute enough and a competent child actress (and to her credit, she might be among the last child stars who followed Shirley Temple's example as opposed to a Lindsay Lohan), but I felt Susan came across as rather obnoxious, one whose wisdom came primarily from lecturing everyone about things rather than from a child's own unique perspective. Wilson's Susan was someone I found unlikable, and a bit disengaged at times (her first scene where she videotapes a message to her mother coming across as slightly monotonous than cutesy). Let me dive into how Sir Dickie was. I found his efforts to be cutesy and giggly more forced than endearing. Hughes' decision to have his Kriss Kringle talk about how The Easter Bunny winters in New Zealand or how he got good advise from the Tooth Fairy was a disastrous one. IF we accept that Santa Claus is real (which is what Miracle on 34th Street wants us to think), we're now left with a few choices regarding Santa's 'friends'. One: the Easter Bunny and the Tooth Fairy are also real. Two: this man in bonkers. Three: Santa is lying to us for his own amusement. Who here can accept One? The film pushes against us accepting Two, and the way Sir Dickie is directed to deliver his lines (courtesy of Les Mayfield), Three is wrong. So, what to make of Santa introducing E.B. and the Cavity Queen? Perhaps Hughes' co-screenwriter, George Seaton, could have restrained him with these odd touches. However, that would have been difficult, given that despite being credited as co-screenwriter to this version of his original Miracle on 34th Street, George Seaton had been dead for 15 years by the time cameras rolled. Am I the only one who thinks giving screenwriting credit to a man who'd been DEAD for a decade-and-a-half before the film was made is just a trifle bizarre? At a certain point, even I thought Kriss Kringle was insane, and that's the LAST thing you want an audience to think. The resolution is both bizarre and slightly insulting to everyone concerned. The judge is about to rule against Kringle when Susan asks to approach the bench. She hands His Honor a Christmas card with a one-dollar bill inside. My first thought was that she was going to try and bribe him, but the actual end result is far more ghastly. The motto of the United States, "In God We Trust", is circled. From this, His Honor declares that because the federal government (in this case, the Treasury Department) can put its faith in something that has not been proven, the State of New York can equally put its faith in something that has not been proven as well. Henceforth, Santa Claus is real, and Kriss Kringle is THE Santa Claus. Somehow, I find this legal reasoning idiotic and a desperate way to get around the more logical conclusion the original came up with. However, the underlying logic behind the ruling should astonish and infuriate all believers. In other words, the message this movie gives is this: it's OK to believe Santa is real, because the U.S. government believes in imaginary beings too (like God). Good message towards the Judeo-Christian audience you're targeting, telling them God is on the same level of reality as the Tooth Fairy. I found this Miracle on 34th Street a little too cutesy and too deliberately sweet for its own good. Everyone is playing to be whimsical, not real. As much as I loath to compare the original with remakes, what made the original work was that there was always an element of doubt about the true identity of Kriss Kringle. Even at the end, we were never totally, absolutely sure if he was THE Santa. This one doesn't, forcing us to conclude that he IS Santa or that he IS insane. Tooth Fairy. Easter Bunny. I wish John Hughes hadn't tried so hard to be clever. He was much better than this woeful misfire. Maureen O'Hara was right...this IS a flop, and the best thing about the remake of Miracle on 34th Street is that in fifty years time, few will remember or watch it, while the original will always be THE version we'll always go back to.